Eric Skillman is a Brooklyn-based writer, graphic designer, and art director best known for his design work on Criterion Collection DVDs and the design process blog Cozy Lummox. His previous comics work includes the self-published comic series EGG: Hard Boiled Stories. His previous work with Top Shelf includes designing the beautiful books Alec: The Years Have Pants, The Playwright, and Ax: A Collection of Alternative Manga. 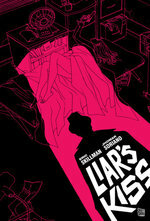 Liar's Kiss is his first graphic novel.